UK - Talks are continuing in Brussels over the European Commission's 3365 million package for farmers. Private storage aid is included in the plan, announced last Monday, and there are indications following a meeting with farm ministers on Friday it will be more attractive than the scheme which ran for two months in spring but took only 65,000 tonnes of pigmeat off the market. This time the aid rates will be more attractive and crucially the scheme is likely to include "other products" such as fats and lard, which are currently in significant oversupply as a result of Russia's phytosanitary ban introduced at the beginning of 2014 following an outbreak of African swine fever in Poland. Meanwhile relationships between Brussels and European farm lobby Copa are reported to be cool this morning after a source in the agriculture department accused Copa of supporting the package in private but criticising it in public. 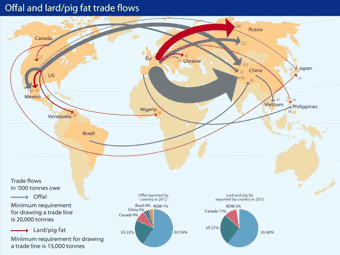 It is difficult for Brussels to do much for continental pig producers in the short-term, as pigmeat is currently in over-supply. Private storage aid is the one measure that could create a short-term upward pressure on prices, as long as it is sufficiently attractive to processors. But analysts point out it will eventually exert a temporary downward pressure on prices, when the scheme ends and stored pigmeat is released on the market. Meanwhile although the Brussels plan mentions co-funded "targeted aid" being made available to member countries, perhaps in a 70-30 per cent dairy-pigmeat split, it is not yet clear if or how this could be made available to British pig producers. Some producers in the country take the view any European Union aid will be counter productive from a British perspective — as it will delay the adjustment continental producers must make if they are to return to profit. On Friday a number of member countries, including Germany, Czech Republic and Lithuania, called for greater clarity on the distribution of funds between "targeted aid" and private storage aid schemes for dairy and pigmeat products.